Rating: 6.3/10. From 283 votes. I doubt John Browning himself could’ve anticipated the popularity of his classic pistol design some 100 years since its birth. I’d venture to say that very few machines, appliances, or devices used for everyday living introduced a century ago are as popular as the M1911A1 pistol is today. It’s a great time to be an 1911 fan. 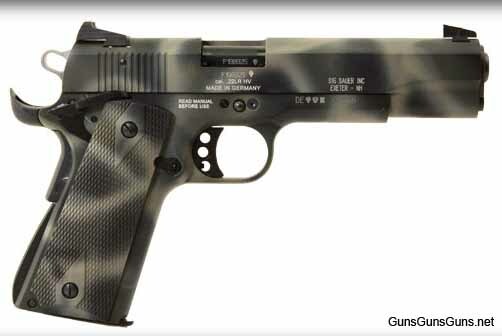 There are more companies building this style of pistol than at any other time in history. Surely these are unique times when a company like SIG Sauer has more 1911s in its catalog than Colt. 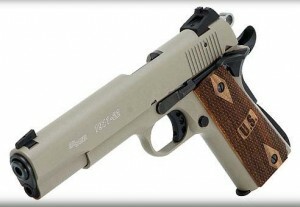 The 1911-22 OD (i.e., olive drab) is one of SIG‘s newest 1911-style pistols, and it’s chambered in .22 LR. I obtained one from SIG, ran it through its paces and wrote it up here. 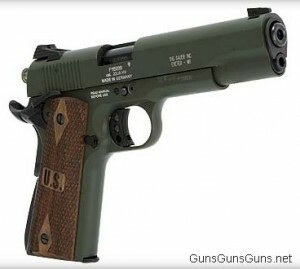 The 1911-22 OD is manufactured for SIG by German Sport Guns, rimfire pistol experts. While it might not be an exact replica of the original .45 ACP pistol, the 1911-22 is very close. The external dimensions of this pistol are near enough to the original that you can use M1911-molded holsters. And in your hands, the gun does not feel like a .22. The slide and frame on my sample are finished in olive drab green, a color favored by many American shooters. (Black and dark earth finishes are also available. Check out photos of all three models below.) The grip panels are checkered rosewood with “U.S.” initials. 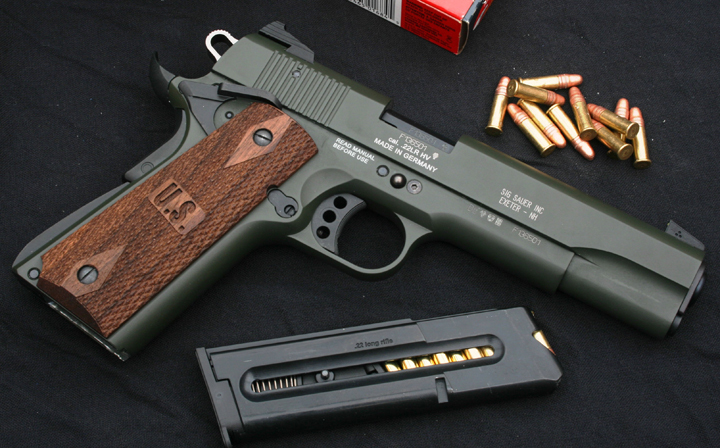 The contrast between the brown finished wood grips and the OD green caught the eye of many attendees of the 2012 SHOT Show in Las Vegas. The manual controls mimic those on the traditional pistol. SIG has included an ambidextrous manual thumb-safety, and internally there’s a magazine disconnect safety. The grip safety is an upswept beavertail design that shooters should appreciate. Both the hammer and trigger are semi-custom: The hammer is skeletonized, and the trigger is the three-hole variety with serrations on the face. 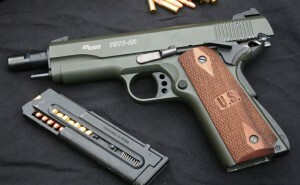 The 1911-22 employs traditional 1911 controls. In this YouTube video (click here), the author shoots the 1911-22. A traditional 5″ barrel pushes the overall length to 8.5″. The gun weighs a hefty 34 oz. empty. The sights are SIG’s Contrast front and rear package. By “contrast,” SIG means three yellow-green dots, one in front and two in the rear, one of my least favorite sight configurations. Sight elevation is fixed, but you can drift-adjust the rear sight for windage. The pistol comes in a hard case with a single 10-round single-stack magazine and all the paper work. Since the advent of the semiauto .22 LR pistol, ammunition choice has always been a factor in a gun’s reliability. Time and again I’ve been in gun shops when a guy comes in complaining his .22 won’t run. The first question a savvy clerk will ask is, “What kind of ammunition are you using?” Nine times out of 10 the guy will reply with some form of, “I don’t know, whatever’s cheapest.” If your .22 LR firearm is a bolt-action, lever-action or revolver you can generally get away with using the cheap stuff. Not so with a semiauto, particularly a handgun. Yes, admittedly there have been issues with some semiauto handguns that would simply not run regardless of the ammunition used. However, my experience has been that if the gun comes from a reputable manufacturer, cycling problems often come down to either cheap ammo or a filthy gun. For this review, I decided to use American Eagle 38-grain plated hollow-point and CCI AR Tactical 40-grain plated round nose ammo. Both of these little rounds are factory loaded to exceed 1,200 fps from a rifle barrel. I figured they’d generate enough energy to cycle the slide on the 1911-22 pistol. 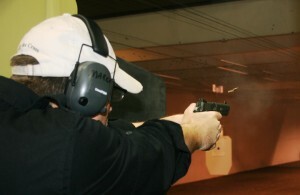 The author pumps .22s downrange with the 1911-22. As it turned out, I was correct. Combined, I fired roughly 150 rounds of both the American Eagle and CCI .22 rimfire ammunition through the new SIG pistol. I’m very pleased to announce I didn’t encounter any feeding or cycling issues with the gun. Regarding accuracy, I deliberately slow-fired into a 3″ dot at 10 yards using a standing two-hand hold. Despite the yellow-dot sights, all the rounds impacted inside the circle with most clustering up in a tight pattern. Both the CCI and American Eagle loads provided solid, consistent accuracy. The sights were right on out of the box and needed no adjustment. The SIG literature states the factory trigger press should run from 4.2–5.6 lbs. My sample seemed to land on the heavier end of that scale. That’s not to say it was too heavy, but it’s not a match trigger. But then again, the 1911-22 isn’t sold as a match pistol. 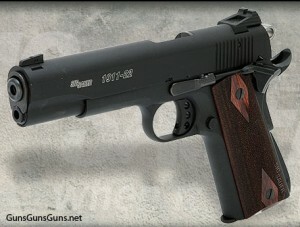 The 1911-22 is a well-built gun and SIG is not giving them away. But it cycled the ammunition I chose with complete reliability, and for a rimfire pistol that’s saying something. Overall I was very pleased with the gun. Paul G. Markel became a United States Marine in 1987 and served his nation honorably during peace time and at war. Among the many hats he has worn in his career, Markel has been a police officer, professional bodyguard, firearms instructor and gun writer. Markel is the creative director and host of “Student of the Gun,” a weekly television show airing on the Sportsman Channel (www.studentofthegun.com). The flat dark earth model. This entry was posted in .22 LR, $251-$500, 1911, Full size, Semiauto, SIG Sauer and tagged Handgun Reviews on February 15, 2012 by Paul Markel. Can you fit regular 1911 parts or sights on this sig sauer 1911-22? I don’t care for the sights & want to put on some metal sights of a higher quality. Is this possible??? I just shot the gun today, and it performed flawlessly. Using CCI ammo, I got a tight group in the black. I bought it to take the place of the three other .45 autos I practice with. I shoot the SIG first then go to the .45’s. Same exact gun as the lower rated GSG 1911-22. Only difference is the Sig stamped on the slide. Five stars, love this pistol, added pachmayr grips, no problems with feeding or firing, it’s sweet!!! @Andrew H, It is true this is the same gun however the difference is the warranty service. Buy your gun from GSG and the warranty is not lifetime and you will be paying a bunch for shipping. Contrary to the many comments of people who said “sig does not warranty this gun” , yes, they actually do. The only time Sig will not is if you have modified it, which is understandable to me at least. I bought this gun for $100 as part of the Sig promotion–buy a .45 1911 and get the .22 for $99.99. So far it has not malfunctioned, but another gent at the range had trouble with his the same day. I noted that his gun was bone dry–no oil anywhere in sight. I disassembled his and oiled it, and voila! it functioned flawlessly. He had taken it from the box with no preparation. No accounting for the ignorant. After several hundred rounds, this has been a reliable and reasonably accurate .22 semi-auto. I also own a Hammerli 215 for Bullseye competition, and the Sig 1911-22 is nowhere near that league, but for the money it’s almost impossible to beat. Recommend highly. Is there a straight mainspring housing available for this model? The standard 1911 mainspring housing is NOT interchangeable, as stated in some ads or articles. The gun performs well. on basic and major complaint. The surface color is a crappy thin coat of paint that wears off instantly if you put in any kind of holster including a soft one. I called Sig about this and they said “tough we aren’t doing anything for you the paint is just decorative”. This is a gun, not a mantle display piece. I will never by any sig again. Not to mention that with other handguns you get 2 magazines, and usually a cleaning rod. Sig gives nothing. Bought my Sig 1911 22 cal. About a year ago and just got to take it to a range. Shot about 150 rounds flawlessly. Took it home to clean it and had a heck of a time with disassembly and assembly. I followed the manuals instructions to a T, but the slide catch was terrible to get out and even more trouble to get back in. It’s still not back in. It seems the front hing point on the slide catch wants to seat but the rear one won’t go all the way in and catches on the slide rail. In fact both the slide rail and the rear notch on the slide catch is showing shiny metal wear. Almost seems like there is a mismatch in machining. The problem is not misaligninment. Anybody having Similar problem?